This week I used a Polkadoodles CD, 'Magical Wishes', printed the pre-coloured image twice, decoupaged the sign post, added liquid pearl snow and mounted it onto red card. I used a scrap of patterned paper and made a sort of misty frame using white pearl embossing powder. 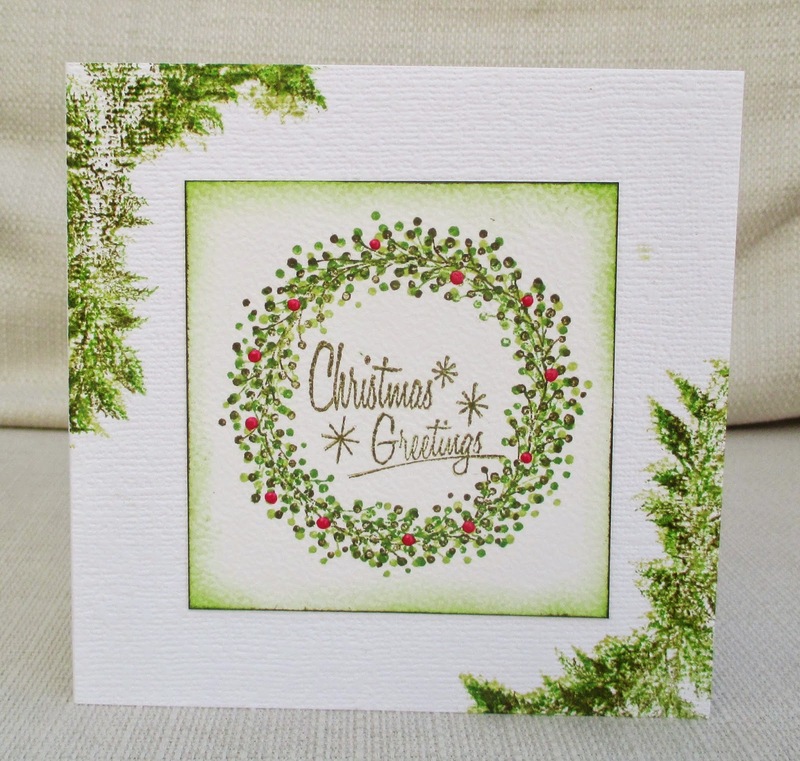 The circular sentiment is a Lily of the Valley stamp , with glitter added. Just to recap, I have challenged myself to make a Christmas card every week , and post it here (to make sure I do it!) . If I do this, by the beginning of December I will have 48 Christmas cards. I have also issued an invitation to anyone who would like to join me by linking up ONE card each week. This link up is always 'Any Christmas Card Goes'. Thank you to everyone who's joined me so far. I love seeing your cards. The dog and bird stamps were in a set that I got free with a magazine (Docrafts Creativity, I think), probably years ago , and only just opened! The word stamps are by Mama Elephant. 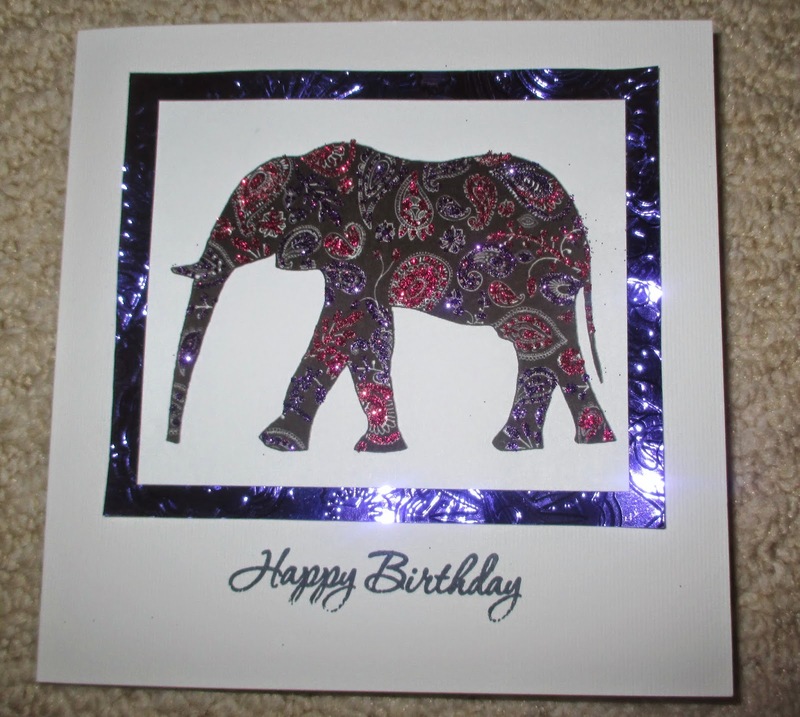 For my DT card I used a pre-coloured image kindly provided by our sponsor, Doodle Pantry. 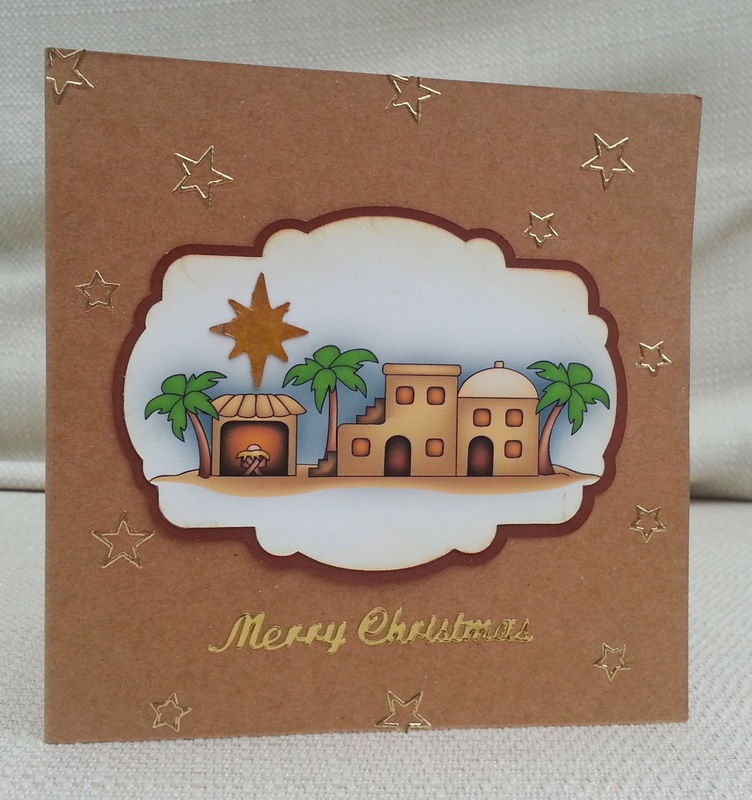 I die cut and mounted it and layered it onto Kraft card, decorated with gold stars. I cut out an over-sized star and placed it over the stable. 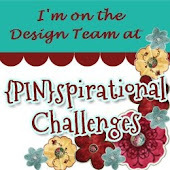 I hope you'll come and join us at Pinspirational - you could win a prize! 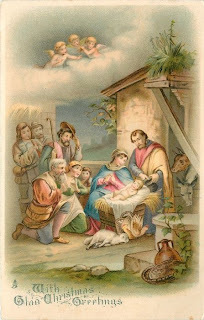 This is probably my favourite vintage Christmas image and I have used it several times. 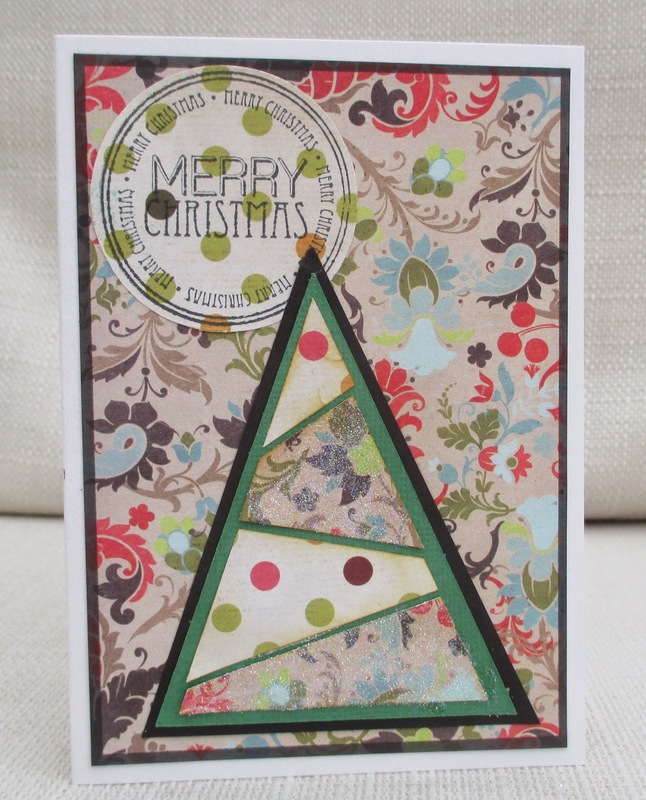 This time I used it with torn and distressed patterned paper scraps, ribbon, a brad and a big snowflake. 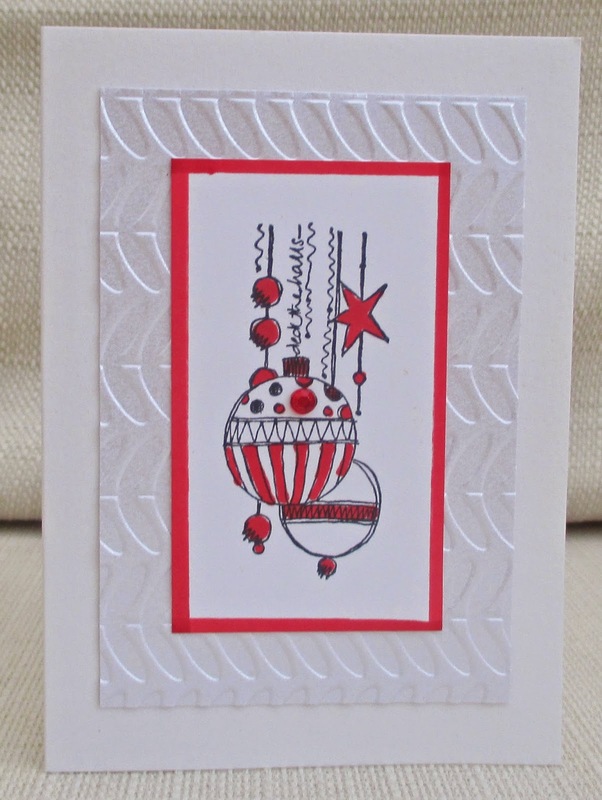 I made the snowflake as part of an online course in designing your own electronic cutting files. Here's a 'hybrid ' card ..the image is a border from the digital version of Echo Park 'Sleigh Ride' and I printed it onto card, trimmed it to fit a card blank, drew a border round the edge with Marine Promarker and stuck it on with 3d foam. 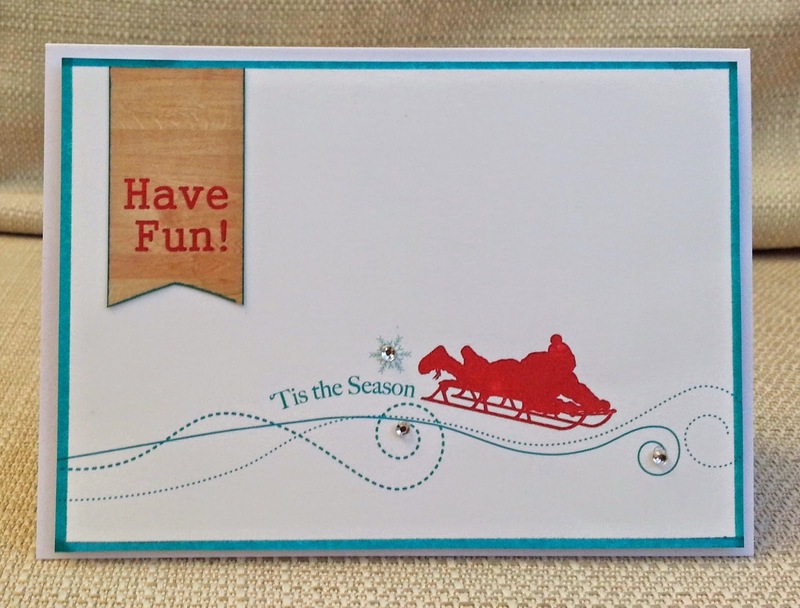 Using Silhouette Studio software I made the banner shape, filled it with a woodgrain pattern and typed in 'have fun'. I printed and cut by hand. Finally I added 3 gems. 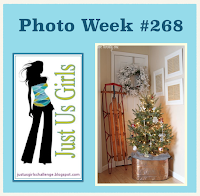 Just Us Girls photo - inspired by the woodgrain floor and the sledge. Less is More jingle all the way. Make My Monday - black, white and hint of red. This week at Make My Monday we'd like you to make a project which is black and white with a hint of red. 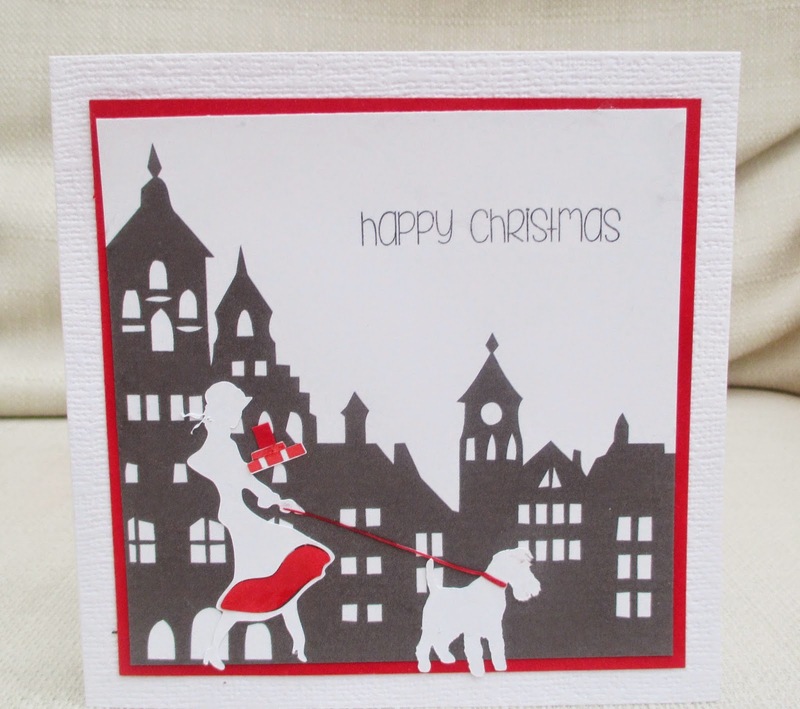 For my card, I used an electronic cutting file to cut out the woman, dog and gifts, and coloured parts of them red with a marker pen. The town silhouette is also a cutting file but I removed the cut lines and printed it onto the card. 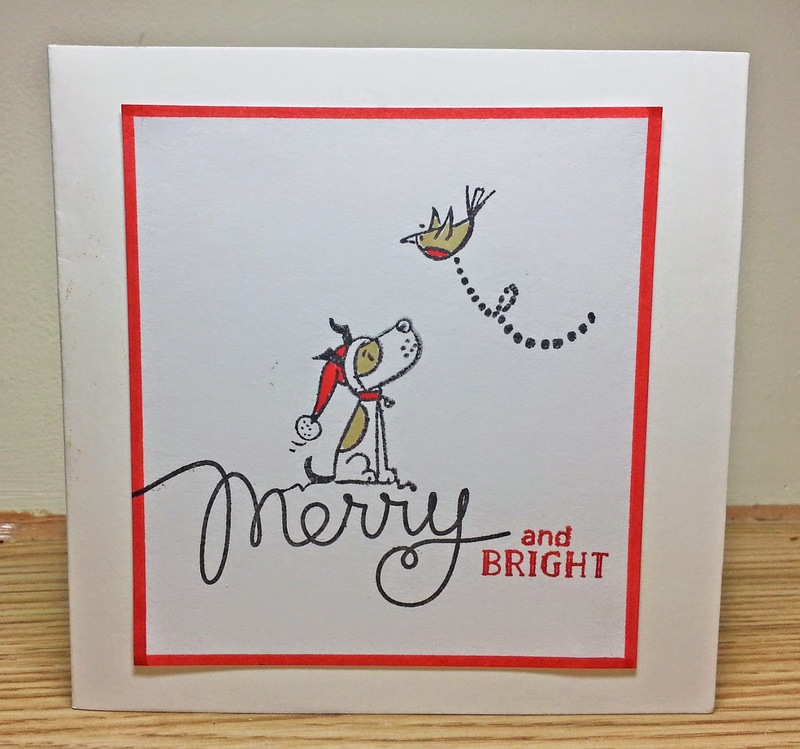 The sentiment is a Clearly Besotted stamp. Hope to see you at Make My Monday. Seeing as I'm on top of my Christmas cards (smug smirk! ), I thought I'd look around to see what other challenges are out there. I decided to join in with the 'Time and Space' challenge at My Time to Craft and use the colour challenge 'yellow and purple' at Incy Wincy . (I hope my yellow is not too orange-y). 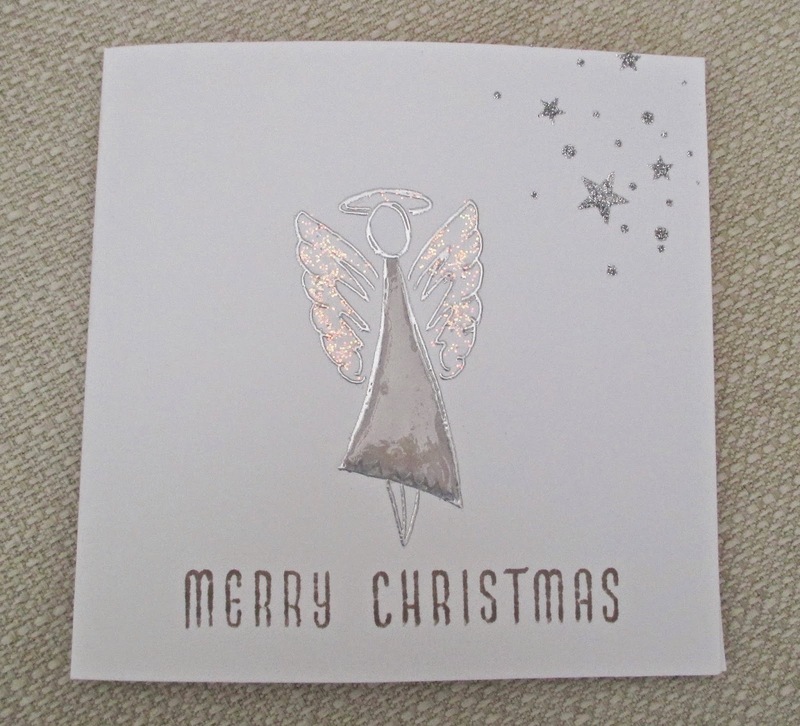 I stamped the sentiment (Clearly Besotted) and sponged the card with lilac Distress Ink. I stamped the stars (Clearly Besotted and a mag freebie) . The digi is from Paper Shelter and I coloured it with markers. 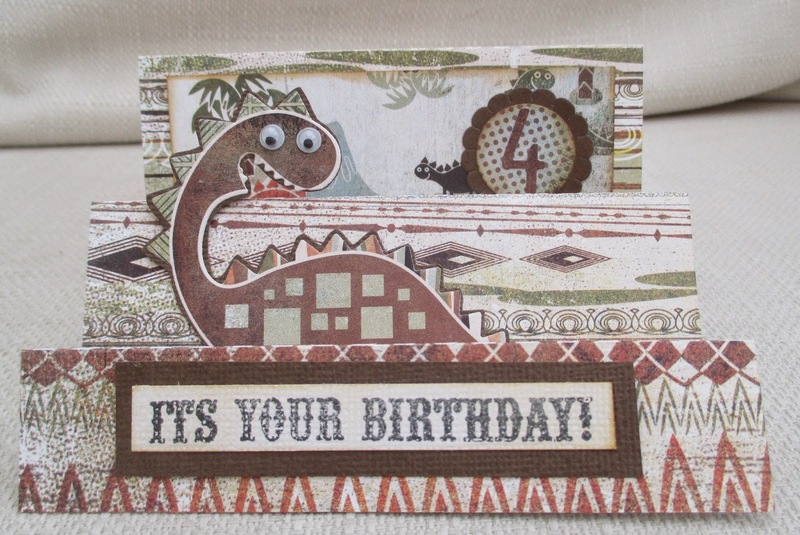 I'd also like to join in with Cute Card Thursday 'stars' , That Craft Place 'anything goes' and Sweet Stampin 'birthday'. 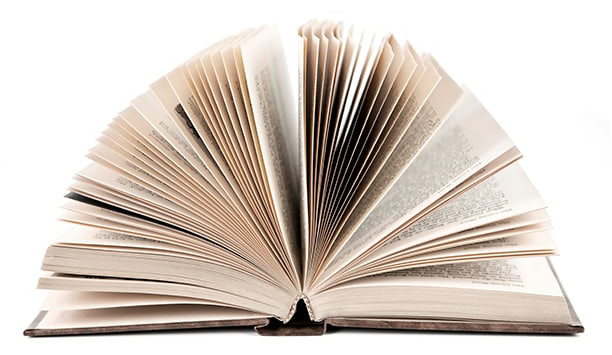 So exciting at Inkspirational this fortnight...we have a prize! The prize will be randomly drawn from all those entries who make a Christmas card and use our twist of No Red or Green. But instead I get to share with you my DT card . I picked two colours I thought were very unchristmasssy and cut two triangle Christmas trees using electronic cutting files I made a few weeks ago. I used a crimper for the back panel and added spray glitter to the sentiment and a bling flourish. 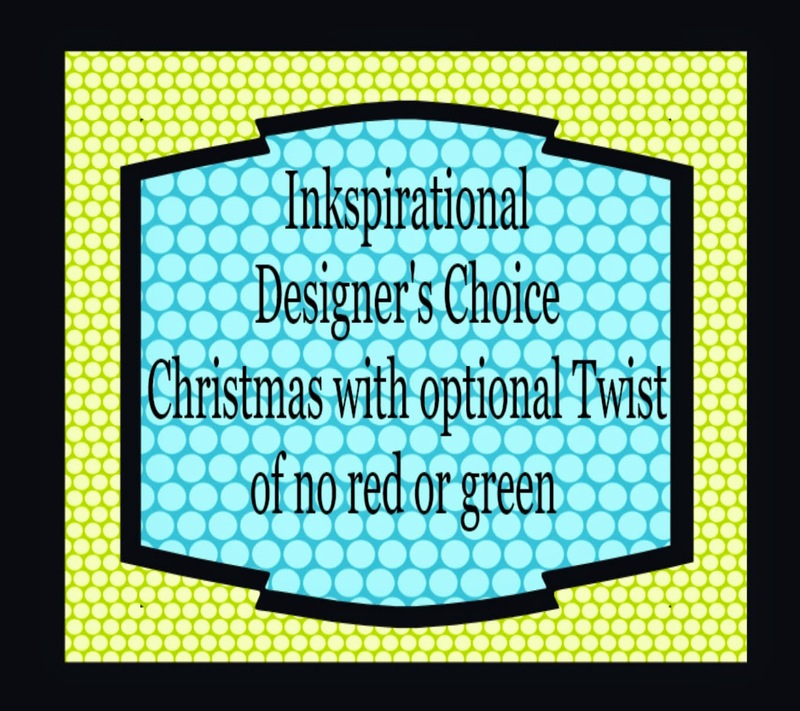 Please come and join us at Inkspirational . 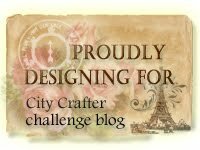 We have a fabulous Guest Designer , Janet , great inspiration from the DT AND the prize!!! City Crafter single word sentiment. 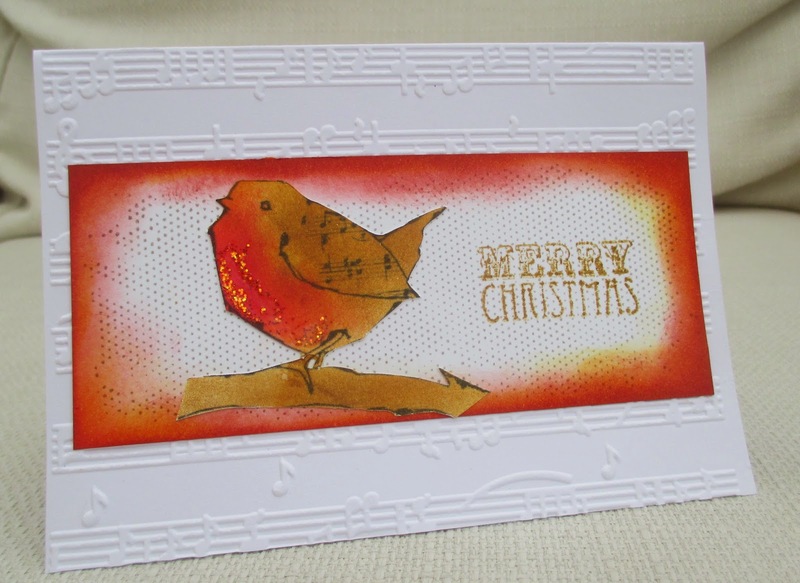 Here I used an A Day For Daisies digi , which I coloured as a robin using distress ink. The background is a Kaisercraft stamp and lots more ink. I embossed the base card with a music design. It's time for a new challenge at Creative Cutting and this time we want you to make a Christmas project that is NOT a card. 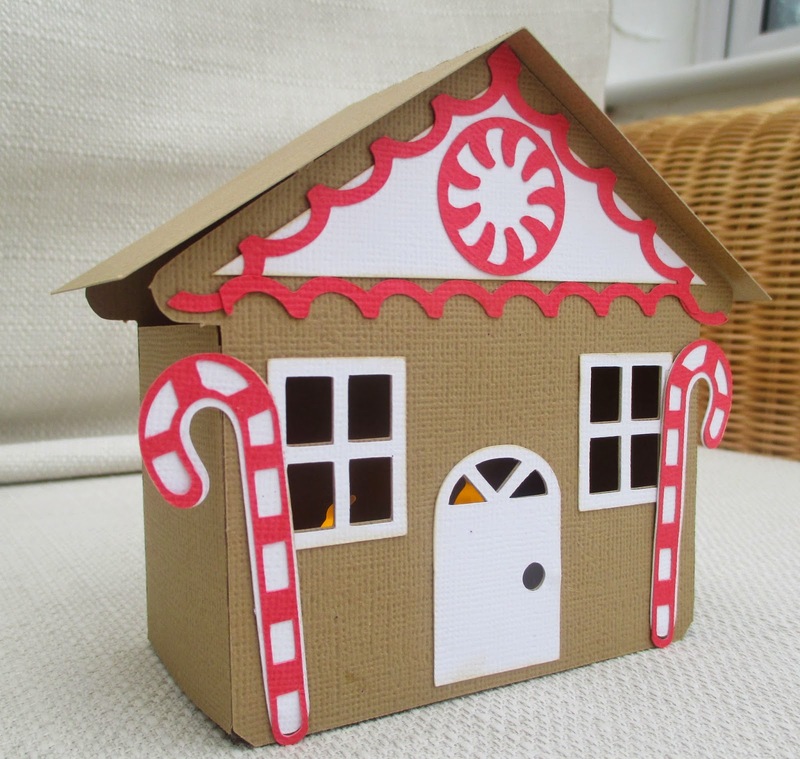 For my DT project, I used Creative Pointe Gingerbread Set and I created a roof, back and sides for it to make it 3d. 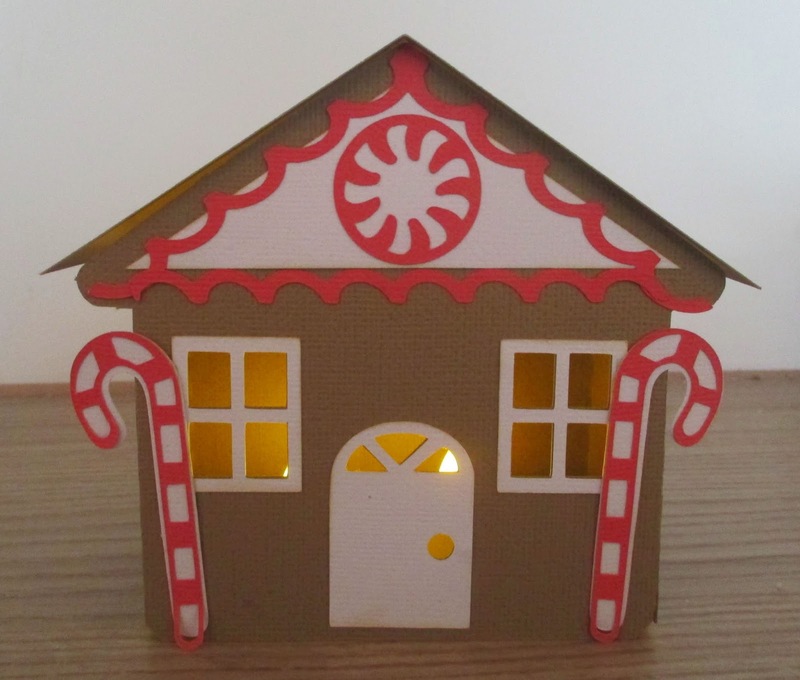 I will use it as a decoration with a battery-operated tealight inside. 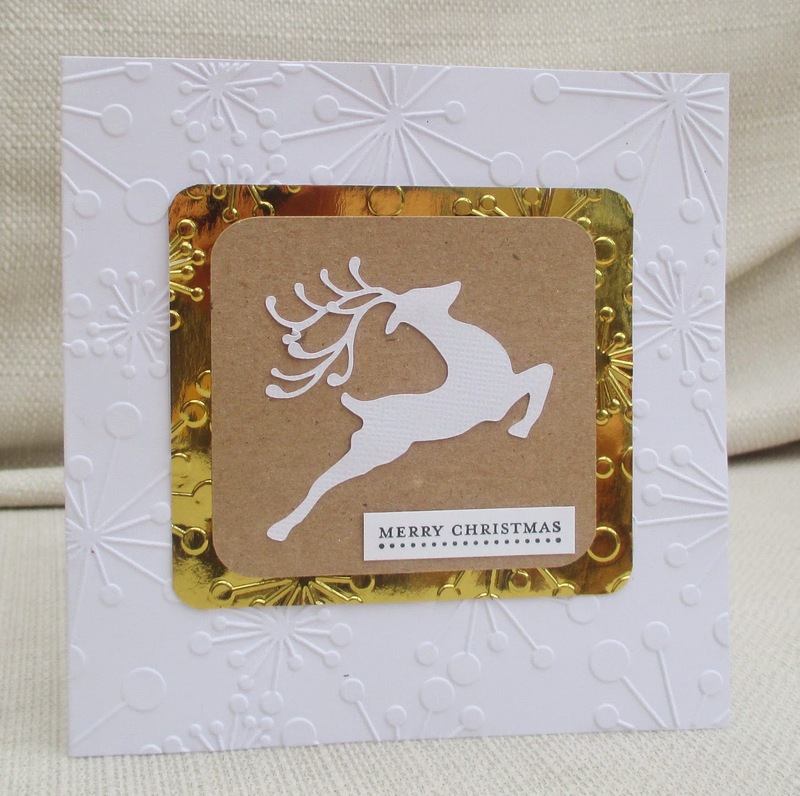 We'd love you to join our challenge at Creative Cutting - all you need to do is use an SVG or similar electronic cutting file to make a Christmas project, and tell us what you've used. See you there. This week's challenge at Make My Monday is Glitter. The elephant is a digi stamp from Bugaboo and I 'coloured' the white bits in the paisley design with pink and purple glitter. 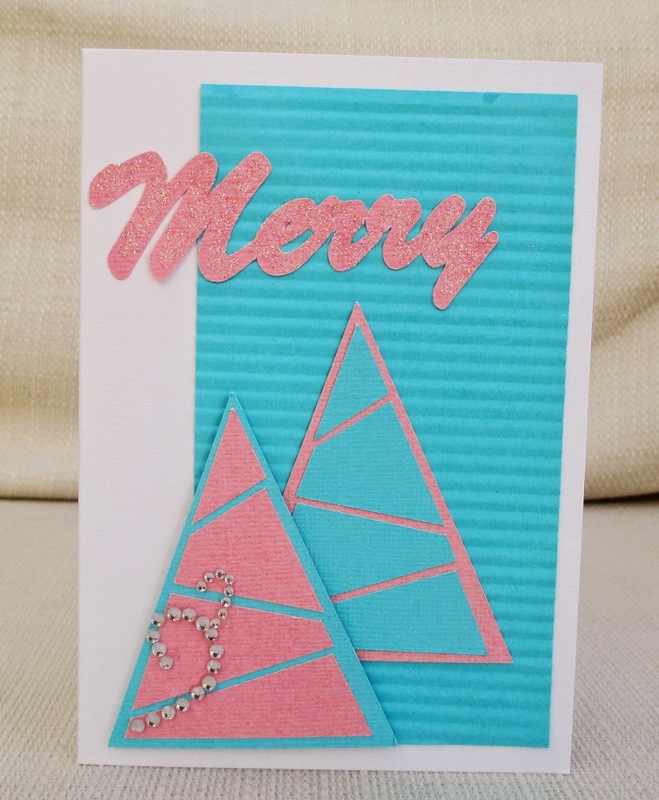 I made a birthday card, but with Christmas on its way, you might make a glittery Christmas card - whatever you make , if it's got glitter, join us at Make My Monday. Here's a little graduation present for my daughter. I'm currently doing an online course learning how to make electronic die-cutting files for the Silhouette and this 'pinked petal envelope' was the first lesson. 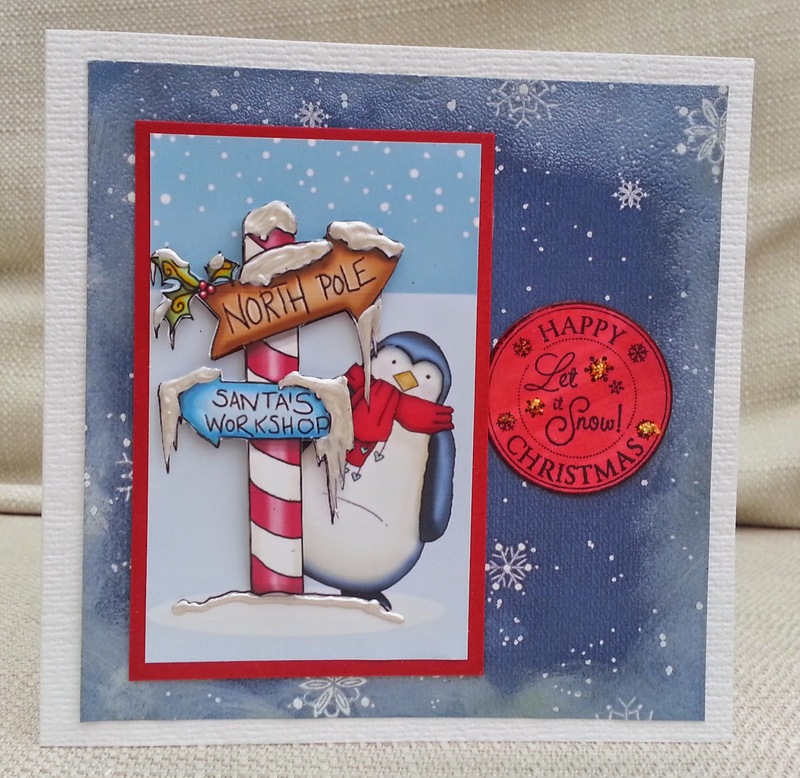 Most of what I've used here is by Stampin Up but I'm not a demonstrator or anything! The label was punched on the reverse of the main paper and stamped with the sentiment. I think the owl charm was a freebie. Why have I called this post 'two charming'? Inside the envelope is a silver grad hat charm for her charm bracelet. As you like it this is my current favourite wrapping as I have just learnt how to make it. 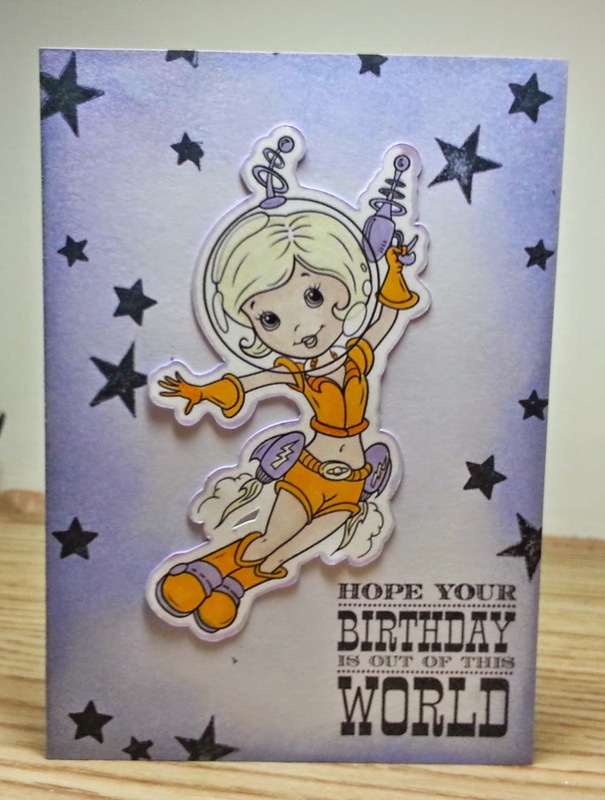 For this child's birthday card I used papers and stickers from Basic Grey 'Archaic' range and a sentiment stamp (Hero Arts?) and some googly eyes. How could I resist the googly eyes? I've taken this photo with the card laying flat on the table in an attempt to a) show the glitter and b) not show myself reflected in the mirror card! 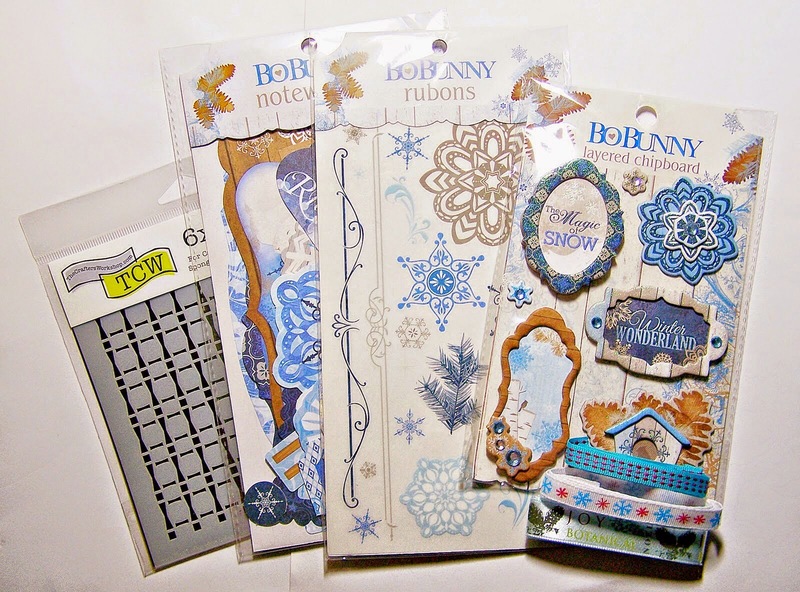 The scenery and the snow are Stampin Up stamps and the sentiments are Mama Elephant stamps. Then I added liquid pearl and glitter. I'm going to enter this into a couple of cas challenges, I just hope it's cas enough. I wish there was some sort of measuring tool for cas-ness. Should I have held back on the bling? As I reach week 44 of my self-imposed challenge I can self-righteously announce that I have never cheated! 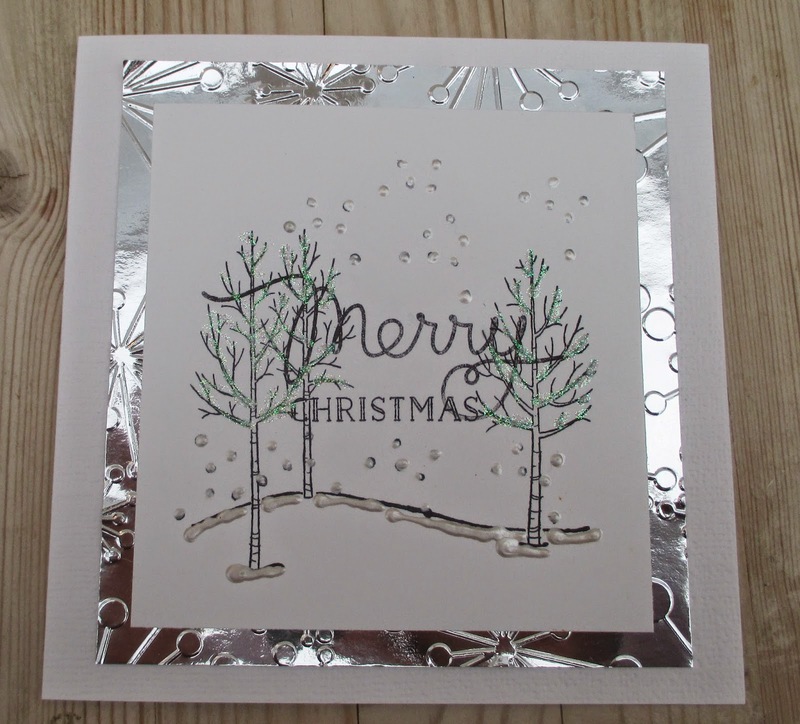 For example, last weekend I was away with my scrapbooking group and made some Christmas cards then that I could have uploaded today. But that would have been cheating because the challenge was to make one per week. If only I was this conscientious about cheating on diets! This week at Make My Monday the theme is 'Berries and Foliage'. 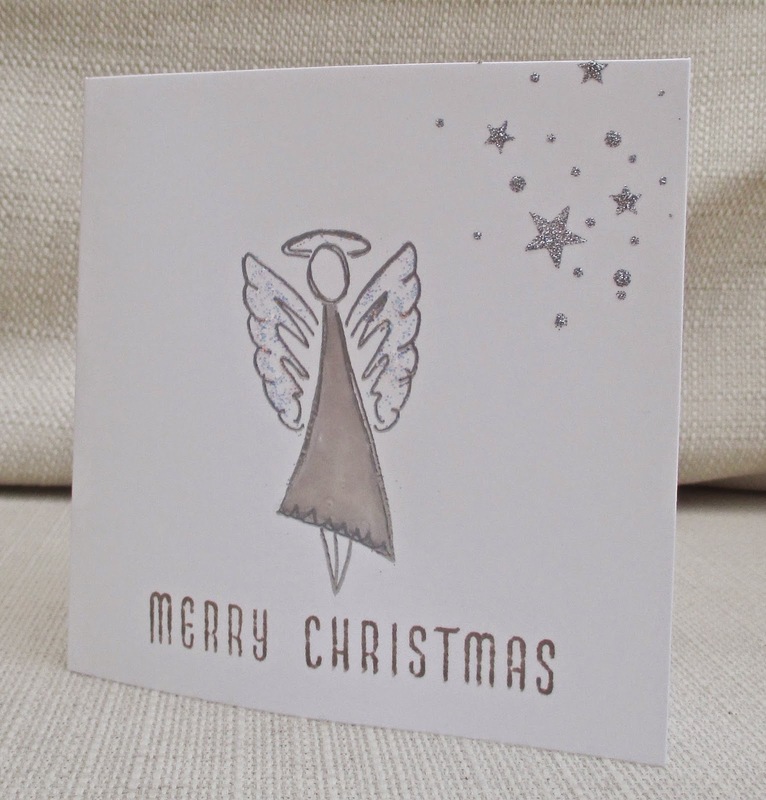 I used a Penny Black wreath stamp and I stamped it three times, on top of each other, using different shades of ink. The berries are liquid pearl and the sentiment is a magazine freebie. The stamp I used in the corners weas another, different magazine freebie and I stamped it repeatedly , as I'd done with the wreath but it looks different because the card is textured. We'd love to see your projects on theme of 'Berries and Foliage' at Make My Monday . I hope you like this card as I think it is my favourite card I have made this year, although I guess some would find it a bit plain! 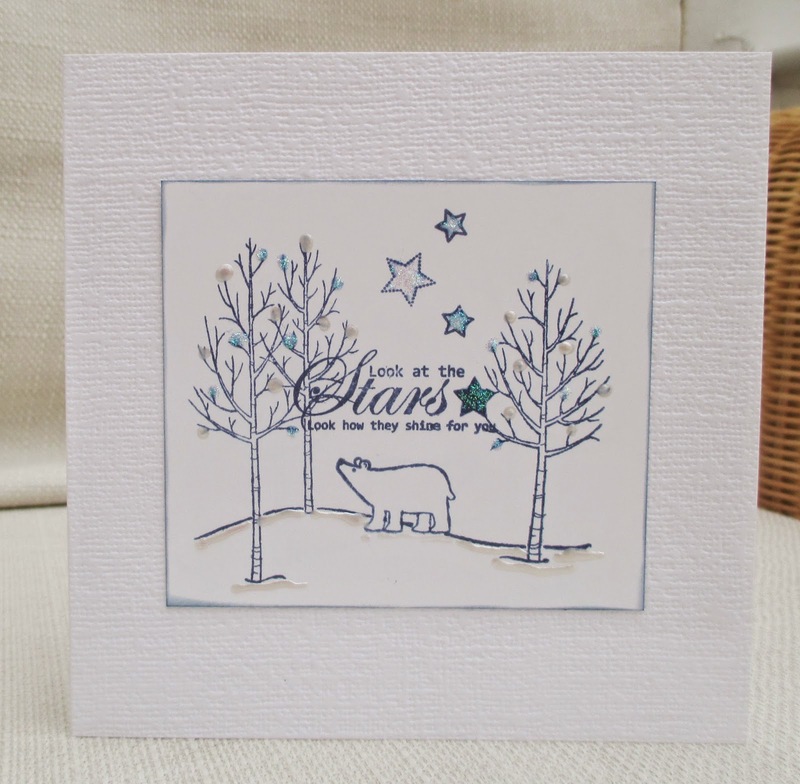 The polar bear is by Stampin Up and I masked him and stamped the scenery (all one stamp, also by Stampin Up). The stars and the sentiment are by Sarah Hurley. I added glitter and liquid pearl. As soon as I saw the sentiment I recognised it as the first line from 'Yellow' by Coldplay. I saw Coldplay perform at Glastonbury about ten years ago . My brother and I were in a dark, waterlogged field watching the band and it was quite magical except that my brother kept saying things like 'I think Coldplay are over-rated.'! If I wasn't on the DT there, I'd enter this into the 'shine' challenge at Inkspirational . Here I've used a Paper Artsy stamp of some baubles - now I do craft blogging I more often hear them called 'tree ornaments', but I had never heard of that term before! It's probably an American English term.(?) Like burlap, which we call hessian. And it's a long time since I called a brad by it's British English name of 'paper fastener'. Colour Me Monochromatic red - Thanks Anita for alerting me to this challenge. ..because it is so hard to photograph shine! I felt this angle best showed the shinyness! The stamp is one of my new-this-year Christmas stamps; it's by Paper Artsy and is already a hot favourite of mine. I coloured the dress grey and covered it with Glossy Accents. The wings were covered in glitter glue and I used a star stencil with glitter texture paste in the corner. Come and join us at Inskpirational for our word prompt - shine. There is also a great Guest Desgner, Rocky - don't miss her tutorial. Although I could have cut this triangle Christmas tree by hand, I created a cutting file for it, so expect to see it in different colours and patterns. The circular sentiment is a Papermania stamp. On the tree, the floral panels are coated with glitter. I have been shopping! Here are my new Christmas stamps. 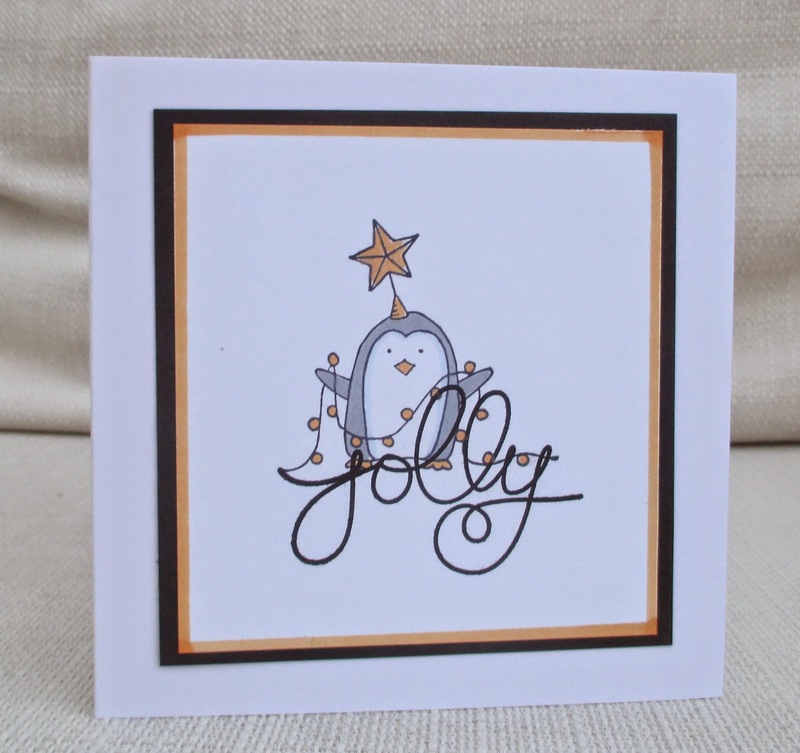 The penguin is from a set by Taylored Expressions, and the 'Jolly' is by Mama Elephant. The star and lights are glittery in real life. At Creative Cutting we have a new challenge - Thanksgiving or Thanks. 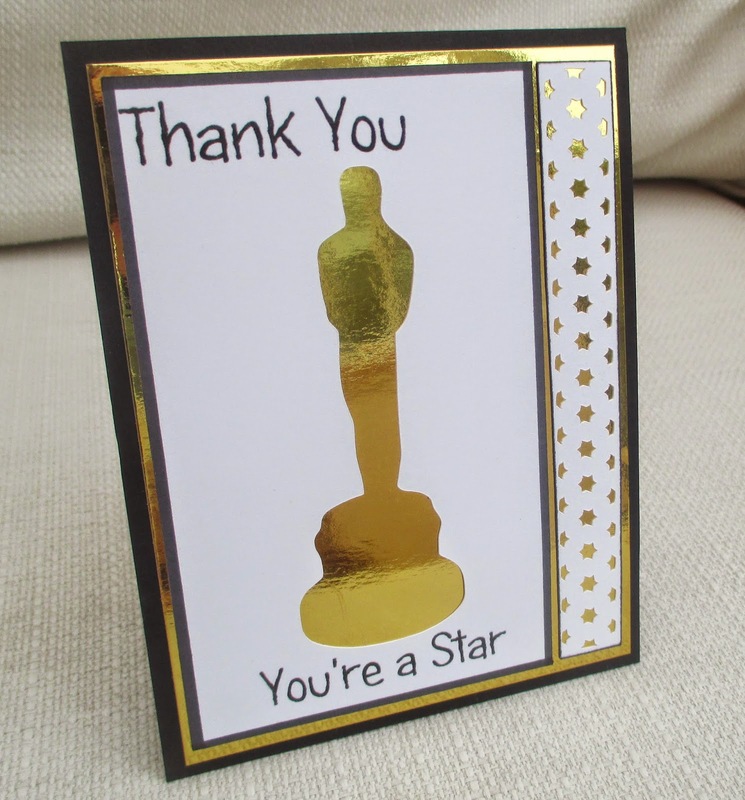 As I'm in the UK, we don't have Thanksgiving, so I made a 'thank you' card using the 'Oscar' cutting file from the Movie Set by The Creative Pointe. We'd love you to join our challenge at Creative Cutting - all you need to do is use an SVG or similar electronic cutting file to make a Thanksgiving or thank you project, and tell us what you've used. See you there. 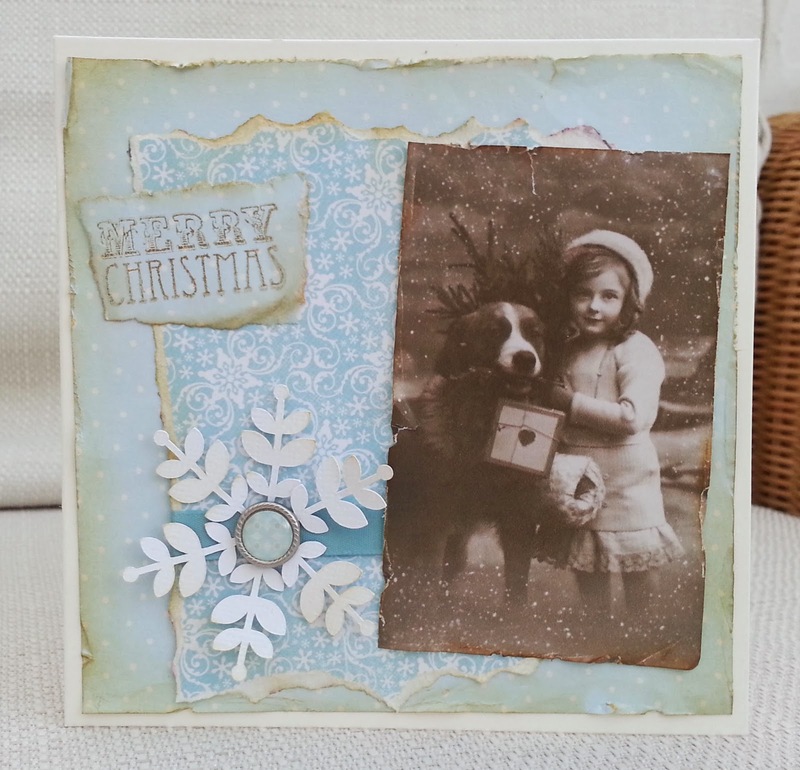 This week at Make My Monday we want to see your vintage style cards. 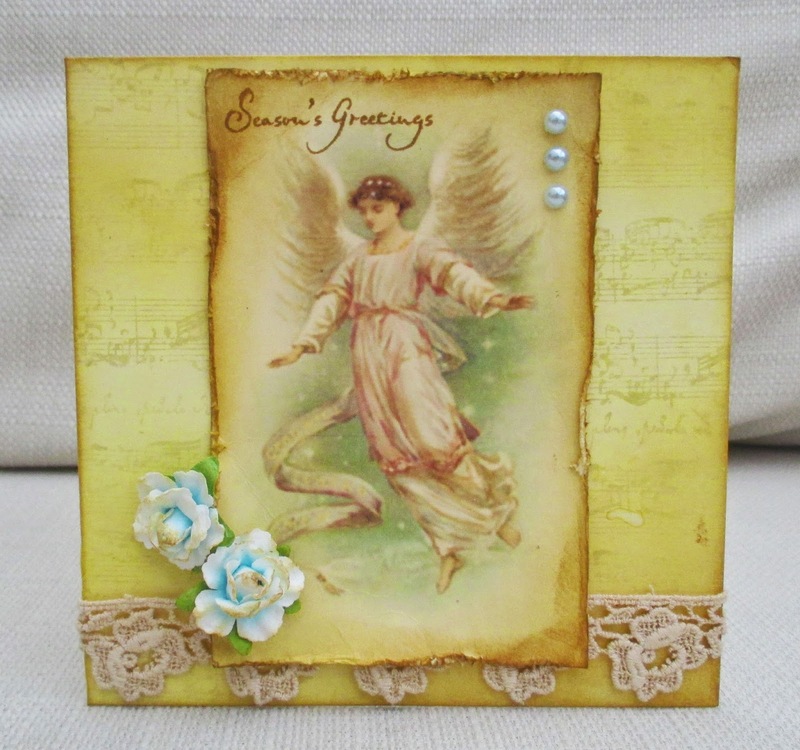 I used a vintage image from Joanna Sheen Crafter's Year CD and I inked and distressed it and stamped the sentiment. I created a background with ink and a music stamp and added embellishments. I hope you'll come and join in at Make My Monday.